Part 2 – The Previous Doomsday of 12,950 BC: what was it like? Since I wrote the doomsday article I have received lots of e-mails, mostly asking me if it is really true and what they should do. I know I had a difficult time coping with this topic, both emotionally and spiritually. I can’t say that I have perfected the right “attitude” about what the future holds. 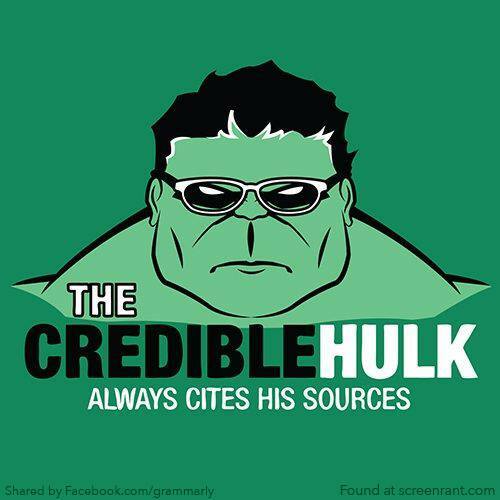 To be honest, I think I always held back from accepting the facts. I had hope. But this new evidence forces me to open my eyes and soul to setting my life in order. I hope it will do the same for you. Although “doomsday” is frequently linked with the Mayan calendar, this is just coincidental. December 21, 2012 is a significant day in astronomy because of a number of important events that will impact our Sun. It would be a “doomsday” even if we never knew about the Mayan calendar. Yet, the more we understand this ancient civilization and appreciate their knowledge of astronomy, we must assume they knew this date to be auspicious. So let’s just talk about astronomy here. There’s a lot of information. I’ll try to make it easy to understand. Let’s begin back in the 1960s with the Apollo 11 manned landing on the moon. On one of their EVA’s (extra-vehicular activities), the astronauts photographed and took samples from some small craters, about 20 cm to 1.5 meters across. When they examined the floors of these craters they noticed what looked like glazed donuts. These were actually chunks of moon dirt that were coated by glass. Hardly anyone in the general public was made aware of this discovery and, even if they were, thay could hardly have realized the significance. 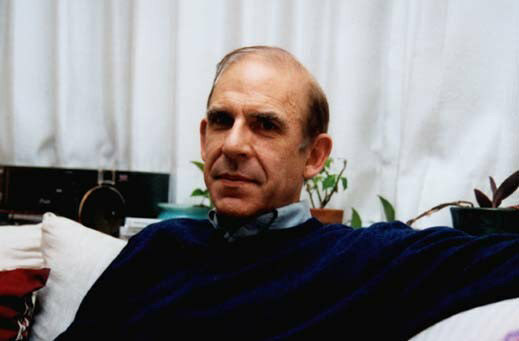 But in 1969, an article in Science by T. Gold  proposed a theory of how they were made. Glass, as we know, is made from melting sand. It occurs natually near sources of high temperature, such as volcanos and meteor impacts. The atom bomb tests in New Mexico’s White Sands area produced a small “lake” of glass at ground zero. So it was never a question about the lunar glass also having been created by something very hot. The fact that the glaze was confined to small patches, 0.5 to 10 mm, suggested to scientists that the surface had been zapped rather than slow-cooked. And the likely source of this zap was our Sun. Gold estimated that the solar luminosity would have had to increase by 100 times what it is normally, for a duration of from 10 to 100 seconds. Also, because of the lack of debris or dirt covering this glass, it must have occurred within the last 30,000 years. This made Gold propose that the Sun — our Sun — does this every 10,000 years or more. He suggested that future research should look for a “trigger” event — possibly a large comet or asteroid impacting the surface of the Sun. He estimated this would only have to be 100 km and weigh 3 x 1021 grams. Decades passed and this theory didn’t receive much attention. Then, as it often does, the theory got a fresh look by a genius, Dr. Paul LaViolette. He was not satisfied with the source of the glass being caused by a solar blast, mainly because the output would have had to be on the scale of a nova, not just a flare. He envisioned another possibility. LaViolette envisioned a large solar flare or coronal mass ejection (CME) that would become magnetically entrapped in the Earth’s magnetosphere . The magnetosphere would then hold on to this fireball of radiation like a magnetic thermos bottle, allowing the Moon and Earth to be exposed for a duration of time long enough to really “flash bake” their surfaces. But LaViolette proposed that this cosmic dust was likely present on the surface of the Moon during the time it was melted into the glass. In fact, he proposed that the entire solar system was full of this cosmic dust at the time of this solar eruption. He was vindicated when polar ice cores showed unusual cosmic dust deposits at srata marking the end of the last ice age . This time period, about 12,950 BCE, approximates the current age of the Moon glass. So where did all this cosmic dust come from? Like Earth, our entire solar system has its own atmosphere, called the heliopause. This “bubble” surrounds the Sun and planets as it travels through galactic space. Like our earth’s magnetosphere, the movement of the heliopause creates a rounded “head” and a narrowing “tail.” Actually, it’s more egg shaped (see above). Until recently, astronomers believed that our solar system was a region relatively free from cosmic dust. The cosmic dust and frozen material of space were kept outside this protective bubble. This was confirmed when the IRAS and Ulysses spacecrafts showed infrared images of the solar system, surrounded by whispy clouds of cosmic dust that increase in density just beyond Saturn. So if the cosmic dust is surrounding the heliopause, what would make it suddenly enter the heliopause and how would this coincide with huge solar flares? LaViolette envisioned something disrupting the heliopause from the outside, impacting it and drawing cosmic dust inside with it and energizing the Sun. The energy of such an impact would be immense. The most logical place to look for such enormous energy was the Milky Way Galaxy. Examining the shape of the cosmic dust clouds, the IRAS satellite team reported that the cloud was tilted relative to the solar system’s ecliptic — the narrow plane containing our planets. LaViolette realized that this odd alignment tracked back to the Galactic center. This was quickly verified by NASA’s Ulysses spacecraft and New Zealand’s AMOR space radar observatory. Whatever caused the last ice age to end, the Sun to flare up and caused the glass to form on the Moon, came from the center of the Milky Way Galaxy. The plot was getting more interesting. 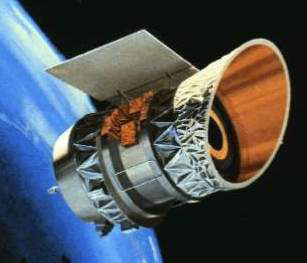 Astronomers have known about intense radiation from space since the 1970s. Multiple bursts of powerful gamma rays were routinely detected and believed to originate from stars in the Milky Way. Assuming this energy originated locally, astronomers concluded this type of gamma ray burst was insignificant and harmless. Then, in December 1997, they had the technology and good luck to catch a strong gamma ray burst and track it. The source was not inside the Milky Way Galaxy. It was from a distant galaxy billions of light years away. A review of other bursts showed that their assumptions had been wrong. All of the gamma ray bursts they were observing were from other galaxies far, far away. The amount of energy coming from objects so distant was a real shock. No one had ever imagined such powerful bursts could be generated by galactic centers. The thought of a burst coming from our own Milky Way galactic center was abysmal. A burst of the same intensity as the 1997 event, originating from inside the Milky Way, would deliver 100,000 time the lethal dose of radiation, killing every life form that was exposed. Could that really happen to us? This question was answered on August 27th, 1998 when an unusual 5 minute gamma ray pulse was located just 20,000 light years away in the constellation of Aquila. This may sound like a huge distance, but to astronomers this is just “next door.” The Milky Way Galaxy, for example, is just 100,000 light years from end to end. The 1998 event was close enough and strong enough to ionize Earth’s upper atmosphere, damage a couple of spacecraft and disrupt global communication. Since then astronomers place gamma ray bursts from the Glaxy’s core at the top of the list of things we don’t want to happen. Before Aquila, scientists just feared exploding stars — novas and supernovas. Now things are different. It’s like living in a ghetto and fearing drive-by shootings and random bullets. Then one day you learn that there’s a nuclear bomb down the street, waiting to explode. Ironically, all of these facts are incorporated in LaViolette’s “superwave” theory. He concludes that there are cyclical and frequent explosions from the Galaxy’s core. These waves of radiation advance outward to the edges of the Galaxy, impacting everything and causing stars to erupt in their path. He believes this is what has happened many times to our own solar system — the most recent superwave of radiation being 14,950 years ago. He envisions the shock wave — or superwave — dragging cosmic dust along with it as it enters the heliopause and energizes our Sun. More troubling is the suggestion by some scientists that this powerful radiation may not require a dramatic burst or explosion to cause eruptions in the Sun. 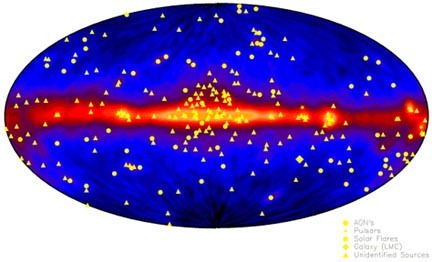 Physicists at nearly a dozen research institutions, including New York University, have discovered evidence for very high energy gamma rays emitting from a narrow band at the equator of the Milky Way. These gamma ray levels mark the highest energies ever detected from the Galaxy. The gamma rays had a median energy of 3.5 trillion electron-volts, or 3500 times the mass-energy of a proton. Previous satellite experiments have seen gamma-ray emissions along the galactic equator reaching up to energies of only 30 billion electron-volts. Perhaps related to this is the puzzling fact that, even though we have witnessed no Galactic explosions or “bursts”, the measurements of cosmic dust streaming inside the heliopause as been steadily increasing  to almost three times since the last solar maximum in 2001. During the solar maximum of each 11 year cycle, the polarity of the Sun shifts — North becomes South and visa versa. 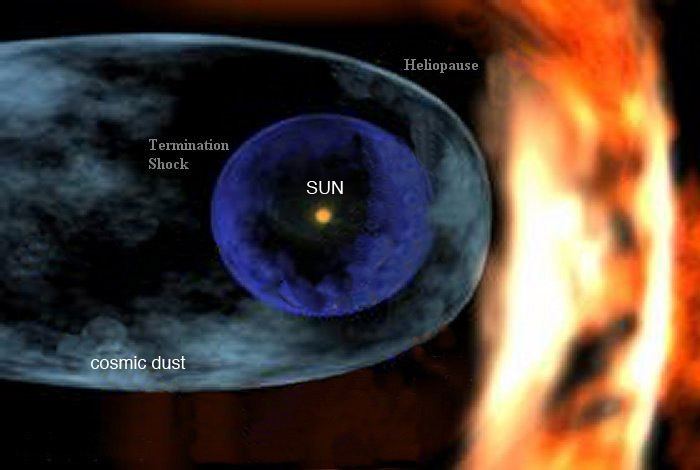 This brief period of magnetic instability allows some cosmic dust to enter the heliopause because the Sun’s “shields” are reduced. But once the new polarity is established, the Sun usually quickly blocks the dust. This time it didn’t happen. Cosmic dust has been streaming in from the Glactic center and astronomers are at aloss to explain why. It’s likely that the solar system is already experiencing the invasive energy from the Galactic equator as we move into position and align with it on 2012. What will it be like when this happens to us? 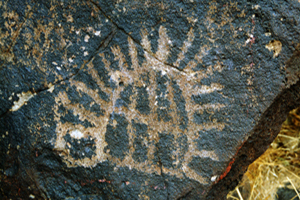 Perhaps the most dramatic evidence of what we can expect in 2012 comes from the most unlikely place — ancient petroglyphs! Ancient rock carvings from around the globe, created during the last solar “zap” 14,950 years ago, seem to illustrate a spectacular event that happened when the Earth was last hit by extremely high radiation. This is a little difficult to explain, but I’ll try. Viewed from the top, the aurora actually forms a luminous and electrically charged cup (or chalice) shape extending into space from each pole. We are all familiar with the sparks that flash brightly when we discharge electrical current. Lightening is a good example. Extremely high energy, called plasma, has been shown to form unique shapes when it is made to discharge — especially around a sphere. The northern lights are an example of how this “spark” of plasma can form luminous, electrically charged sheets or tubes at the Earth’s poles. Theaurora, as it is called, occurs when mild energy from our Sun is trapped and dissipated by the Earth’s magnetic poles. Extremely high energy — the type that would have caused the Moon glass and zapped the Earth — creates a more elaborate discharge. Physicists call it a z-pinch formation. The z-pinch has been extensively researched by a group headed by Anthony L. Peratt with the Los Alamos National Laboratory, Los Alamos, NM and is described in his paper, Characteristics for the Occurrence of a High-Current Z-Pinch Aurora as Recorded in Antiquity Part II: Directionality and Source. 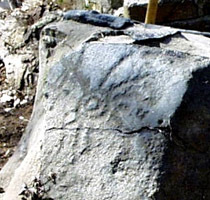 In this paper, Dr. Peratt illustrates the shape and characteristics of this high energy discharge on the Earth and shows thousands of petroglyph sites all over the globe where this z-pinch was observed and recorded in ancient carvings. The term z-pinch originates from experiments where physicists made extremely high current to flow through thin wires that were arranged vertically in a tubular formation. They noticed that the energy quickly vaporized the wires, but the magnetic field generated by these paths remained and contained (or “pinched”) the stream of energy, collapsing the streams of energy toward the center of the tube-like configuration — called the z-axis. When the streams of energy converge, they form unique shapes that persist and can be observed as Birkeland elements, named for their discoverer. If the Earth was zapped by high energy radiation, either from the Sun or the Galactic core, the planet would be surrounded with distinct lines of energy, converging at the North and South pole. 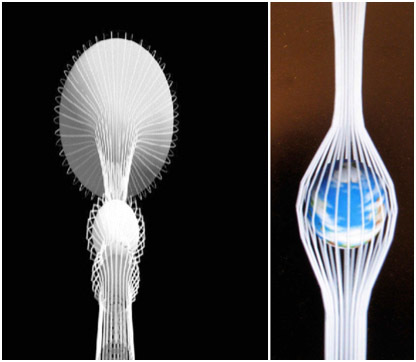 These bands would continue to extend well out from the planet’s poles and into space and would be visible from almost every point on Earth — each with its own unique perspective. Laboratory experiments whith a metal sphere, representing Earth, show the “chalice” shape created by high energy paths [above]. Oddly, repeated experiments show a preference for 56 “rays” or distinct bands of energy. This same number is often depicted in the ancient petroglyphs! 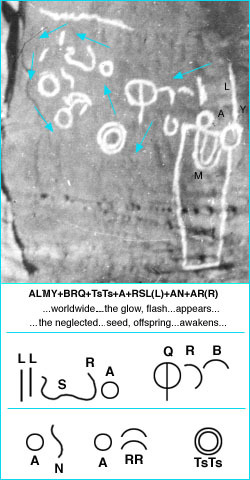 Recent global archiving of global petroglyphs have demonstrated that these shapes were correctly recorded in rock carvings by humans who withnessed this event! 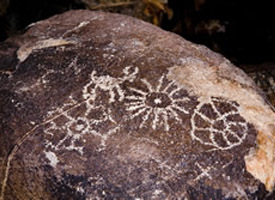 When researchers went to various petroglyph sites that contained the z-pinch artifacts they carefully plotted the GPS location and noted if the ancient artist had a clear view of the Southern horizon. Almost all of the sites had this view. 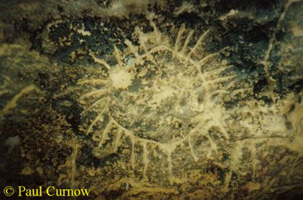 The number and extent of these global petroglyph sites clearly demonstrate the purpose of this art. Also, depending on the latitude, depictions of the z-pinch corresponded to the exact perspective that would have been expected. 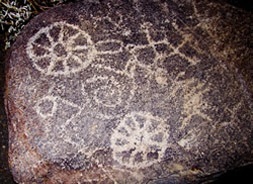 Some examples of z-pinch petroglyphs are shown here. We highly recommend reading the complete article. We especially thank team member, John McGovern, for bringing this important work to our attention. The recent data shows that dramatic and potentially deadly effects can result from solar flares and coronal mass ejections. Substantial data suggests that an event, similar to the one anticipated in the 2012 “doomsday” scenario, occurred about 14,950 years ago and was recorded by ancient humans. This event appears to have lasted for several years in duration and was responsible for the abrupt end of the last ice age as well as a substantial culling of the human population. The surprising findings of LaViolette, supported by other research, suggests that the extreme solar event corresponded to powerful radiation coming from the center of the Milky Way Galaxy and was associated with gamma rays and cosmic dust. Recent observations have shown a dramatic increase in gamma ray energy in the Galaxy’s equator which will be in maximum alignment with our solar system on December 12, 2012. 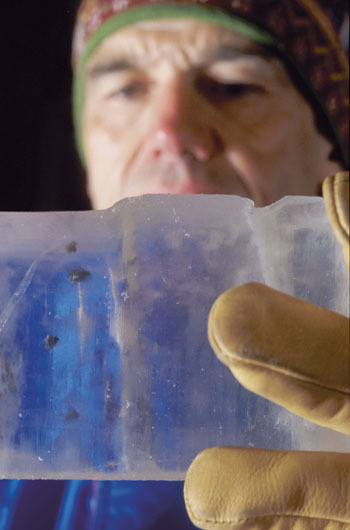 The past records in ice cores (strata from 13,880 to 13,785 BCE) suggest that intense radiation from this last event could have lasted many years. It seems highly likely that this alignment will cause another extreme solar event since other factors precipitating a “solar maximum” (i.e. the opposition of major planetary barycenters) also converge on this exact date. The fact that galactic centers routinely radiate lethal gamma rays makes it unlikely that life, at least as we understand it, can survive in the universe. Sooner or later it is destined to be zapped. 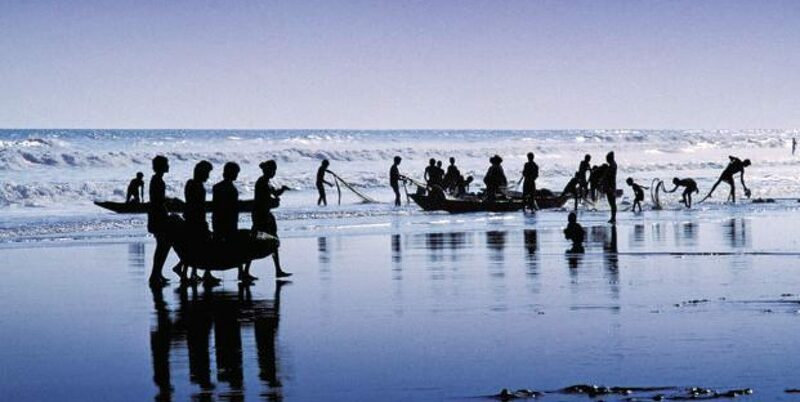 A new genetic study of Y-chromosome variation by Dr. Marcus Feldman of Stanford University shows that the population from which the world’s present population is derived consisted of about 2,000 individuals. Somehow, humans, flora and fauna did survive the past doomsday and some may yet survive past 2012. Indeed, many of the ancient prophecies I have encountered in my travels around the world have spoken of a “bright light” or “flash” followed by the “good seed” (i.e. humanity) which would rise up and repopulate the world. Organisms on Earth, including humans, have evolved during quiet times — between the lethal blasts from our own Milky Way center. This means that we are indeed quite unique (and lucky). But it also means that our ultimate demise is part of the natural order. This universe is larger than ourselves and our lives. We are just transient phenomena, seemingly running counter to the laws of entropy, yet a part of the cosmic reality. This is neither good or bad. It simply is. And yet there is part of us that may continue. This hope is what we must hold on to. Tell me what you think. Mass Extinction: Why Did Half of N. America’s Large Mammals Disappear 13.8 and 11.4 Thousand Years Ago? As reported in ScienceDaily, years of scientific debate over the extinction of ancient species in North America have yielded many theories. However, new findings from J. Tyler Faith, GW Ph.D. candidate in the hominid paleobiology doctoral program, and Todd Surovell, associate professor of anthropology at the University of Wyoming, reveal that a mass extinction occurred in a geological instant. During the late Pleistocene, 40,000 to 10,000 years ago, North America lost over 50 percent of its large mammal species. These species include mammoths, mastodons, giant ground sloths, among many others. In total, 35 different genera (groups of species) disappeared, all of different habitat preferences and feeding habits. What event or factor could cause such a mass extinction? The many hypotheses that have been developed over the years include: abrupt change in climate, the result of comet impact, human overkill and disease. Some researchers believe that it may be a combination of these factors, one of them, or none. A particular issue that has also contributed to this debate focuses on the chronology of extinctions. The existing fossil record is incomplete, making it more difficult to tell whether or not the extinctions occurred in a gradual process, or took place as a synchronous event. In addition, it was previously unclear whether species are missing from the terminal Pleistocene because they had already gone extinct or because they simply have not been found yet. However, new findings from Faith indicate that the extinction is best characterized as a sudden event that took place between 13.8 and 11.4 thousand years ago. 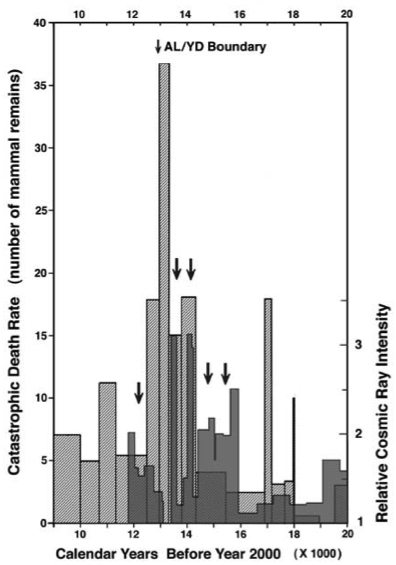 Faith’s findings support the idea that this mass extinction was due to human overkill, comet impact or other rapid events rather than a slow attrition. Gold, T. “Apollo II Observations of a Remarkable Glazing Phenomenon on the Lunar Surface.”Science 165 (1969):1345. Anthony L. Peratt, Fellow, IEEE, John McGovern, Alfred H. Qoyawayma, Life Member, IEEE, Marinus Anthony Van der Sluijs, and Mathias G. Peratt, Member, IEEE, “Characteristics for the Occurrence of a High-Current Z-Pinch Aurora as Recorded in Antiquity Part II: Directionality and Source,” IEEE Transactions on Plasma Science, Vol. 35, NO. 4, August 2007. Markus Landgraf, Max Plank Institute.